View More In Oral Pain Relief. Bring Bruxism to a GRINDING Halt!! With an estimated 60 million adults affected by bruxism, more commonly known as teeth grinding or clenching, individuals may be affected by a variety of symptoms including worn tooth enamel, recessed gums, increased tooth sensitivity, jaw pain, earaches and headaches. 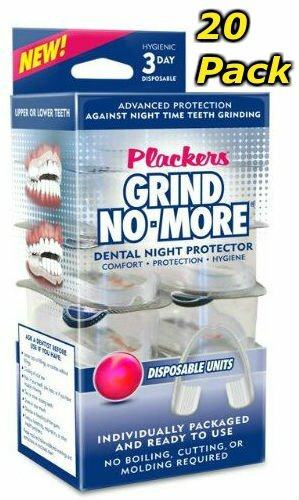 Plackers Grind No More Dental Night Protectors provide exceptional comfort, protection, and hygiene. Comfort: The streamlined one size fits all is designed to be worn on upper or lower teeth - whichever is more comfortable. Protection: Meets the demanding needs of both "clenchers" and "grinders" - bite plate alignment grooves, absorbing bite plates, and stabilizing bite plate lips work together for maximum protection. Hygienic: Each GNM is disposable - it's the hygienic alternative! GNM can be used for up to 3 days.